These versatile, extra-large powder-free disposable latex gloves from Noble Products are designed for consistent fit, flexibility, and resilience! They are ideal for a variety of uses in the food service industry, from food handling and preparation to janitorial and housekeeping tasks. As a perfect general purpose solution, these non-sterile, disposable, powder-free latex gloves are ambidextrous and 4.5 mils thick. When you don't want to dirty your hands or if the job is super oily, use these. They are so handy and are thick enough that oil does not soak through. The Extra Large Powder Free Disposable Vinyl Gloves really one in handy for myself and my husbands treat making business. It keeps our hands clean while coloring fondant by hand as well as keeps the food safe. Great purchase! Will definitely buy again! Great product! Been using the gloves for 2 weeks now and will continue for my restaurants. Thank you WebstaurantStore a bunch for providing quality products! Good quality for the price. Durable and great for preparing and handling raw foods. Also good for cleanup. Buy by the case and save even more. These gloves fit great and are super comfortable. The have bit of a stretchiness to them which makes them fit better. Our staff really like these. Only reason I didn't give them five stars it that they tend to rip easier than other gloves. These Noble latex gloves work well in our restaurant for our cooks to use on the line. They are easy to switch out and help product your hands from hot foods without melting. They do not tear very easily. The gloves are easy to get on and work great. They are thin enough that still easy to pick up items but yet be sanitary. Good quality gloves. Very durable and thick vs. some of the other gloves offered at this price. You should definitely consider these gloves they get the job done. Great disposable gloves. They are perfect for handling raw seafood to prevent contamination. They have nice durability and and sustainable in water. Our staff like using the disposable gloves. The Noble Products Extra-Large Powder-Free Disposable Latex Gloves for Foodservice are our top choice for food handling gloves. These latex gloves don't restrict the food handler, while at the same time they are durable enough to resist breaking. Really cheap and solid gloves, they are very stretchy and thin which is good for detailed work where thicker gloves get in the way, but they do not protect your hands from heat or cuts! Great glove for xtra large hands. I have worn these with my ring and watches and works just fine. Meet all standards for food service and is very comfortable. Great gloves. Slightly softer than others which make them easier to put on and that little bit more comfortable . Can't argue with the price either. Will definitely order again. These are great to have on hand for larger hands and also they work well for putting over winter gloves or other gloves to keep them clean and the food your working clean too! These are a nice quality latex glove from Noble. Available in a powdered or powder-free and in all sizes. These are perfect for food service or cleaning in any type of business or around the home. These are great gloves they are very durable for the average caterer. only negative thing i would say is the packaging is very poor which makes it difficult to get the gloves out at times. These gloves were the perfect size for large men to wear. Great to have on hand so they can grab a new pair of gloves whenever. I absolutely love this product! This noble products extra large powder free disposable latex gloves are great for the food service! These gloves are a one time use. Easy to put on and take off. Good quality that does not rip when you put them on. Very competitive price for the quality product. I have been using these gloves for quite some time now. They are great and affordable. When I run out of these in will be back to purchase the same gloves. Most food service gloves are very thin and easily torn. These however are not. Our maintenance person wears them for everything and hasn't had any torn so far. 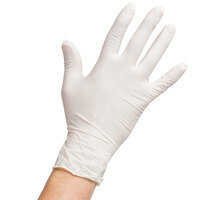 Noble latex gloves are a good value glove for food service or general cleaning. These fit well and are flexible. Powdered gloves are a little easier to get on and off if hands are damp. Good value for disposable gloves. And powder free is good for food preparation. They are not easy to be broken. This is already my second time purchase. These gloves are really great. They are strong enough to withstand the small tasks that I need them for and I don't need to worry about them tearing while being used. Perfect solution for my messy jobs. These extra large gloves were too large for me. I have big hands but these are huge. I used them all and they worked well for mixing colors in fondant. Will order smaller size next time. Not a huge fan. They are impossible to put on if your hands are just the tiniest bit wet. Might as well just get nitrile. Great gloves we order in bulk. Not only are we saving money but we are also getting our monies worth. The quality is great. We will continue to order. I have very big hands, finding a glove that is comfortable and that I don't feel squished in is hard to find. But now that I've found these , life is good. Great product and love they are powder free. They will dry out your hands if you aren't careful. Overall they are sturdy and hold up to prep and kitchen use. these are great and very durable have yet to have one tear. the price is unbeatable. the powder free is great for food handling as well. Great glove for people with larger hands. I have purchased other gloves at other stores and these seem nicer. Will continue to add these on to orders. A lot heavier gauge than the thin vinyl ones. My cooks have never complained about them, and they have been extremely tear resistant aside from aggressively putting them on. We buy these gloves in multiple sizes and have been very pleased with the product! The quality is great and we are so happy to find them! I've ordered may different kinds of gloves and these were the ones that my cooks prefer. They are easy to get on and the price is great. This is really a great glove. We use all 4 available sizes and have been highly satisfied. They're not like some of the competitions' which rips and shread easily. Price is exceptional when compared to other stores online. The quality is excellent. We primarily use them when butchering our game in deer and turkey season, and when working on our vehicles. These gloves are very good. Generally, gloves easily rip near where you put your hand in but these do not at all. Even when your hand is moist, it is easy to put these gloves on. Great brand of foodservice gloves. Powder-free makes these gloves more versatile. Great for food preparation tasks as well as ready to eat tasks! Great price. Durable gloves too. Easy to switch when switching tasks! I cannot say enough about the noble gloves. This is my second case of these gloves. I have been pleased with construction of the gloves and they hold up very well.